The SPRU process buildings have been removed and backfilling of the excavations is nearly completed. 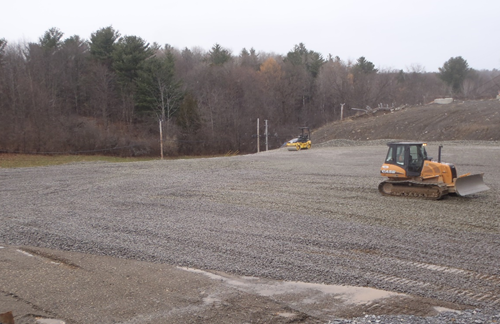 Regrading and seeding of the SPRU areas are expected to be completed by the summer of 2019. The demolition site of Building H2 at (SPRU) in Niskayuna, New York. The demolition site of Building H2 at the Separations Process Research Unit (SPRU) in Niskayuna, New York. Building H2 was one of two buildings at SPRU that supported improvements in the chemical separation of plutonium for the nation's strategic defense early in the Cold War. Demolition of Building G2 has already been completed. NISKAYUNA, N.Y. 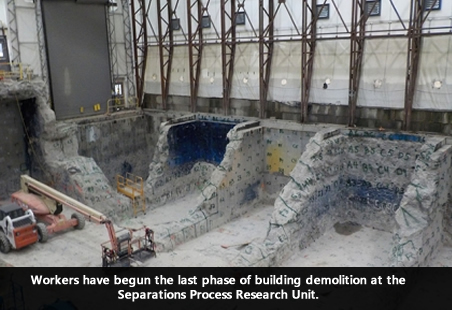 The U.S. Department of Energy (DOE) has completed the last phase of building demolition at the Separations Process Research Unit (SPRU), located at the Knolls Atomic Power Laboratory. 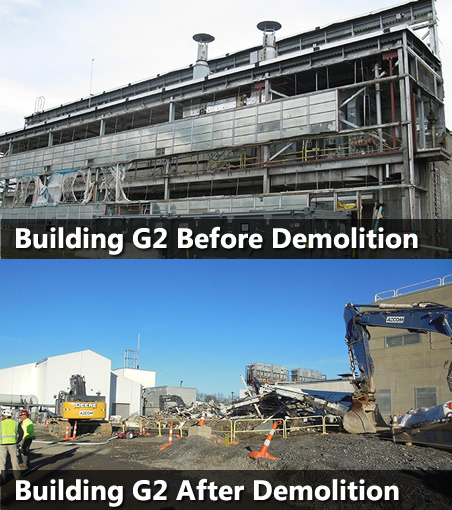 Demolition of Buildings H2 and G2, which began in 2016, finished in May 2018. The buildings supported improvements in the chemical separation of plutonium for the nation’s strategic defense early in the Cold War. The demolition work culminates several years of demolition operations by AECOM, DOE’s cleanup contractor at the site. Remaining work includes removing concrete debris, verifying the remaining soil meets cleanup objectives, and backfilling the excavations and restoring the work area. The project is expected to be completed this fall. 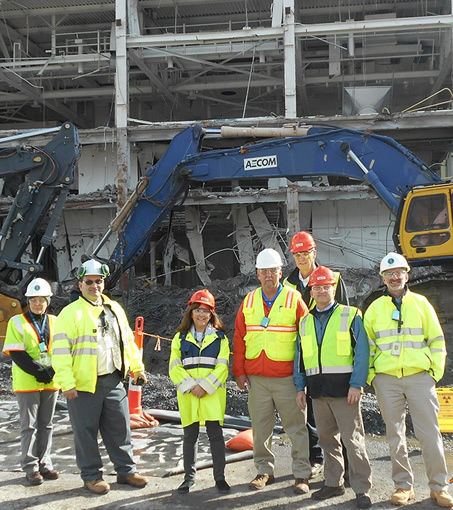 "The DOE SPRU Field Office staff and our AECOM contractor worked together closely to safely and successfully complete this major project milestone,” Federal Project Director Steven Feinberg said. 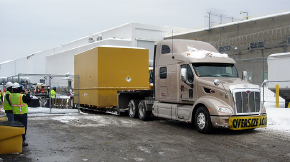 A small amount of radioactive waste material containing hazardous chemicals known as mixed transuranic waste will remain and be stored safely, securely and in compliance with environmental requirements after project completion. This waste is destined for disposal at the Waste Isolation Pilot Plant. On March 29, 2018, DOE applied for a storage permit with the New York State Department of Environmental Conservation. The U.S. Department of Energy Office of Environmental Management (DOE-EM) invites the public to a meeting to discuss a required permit for storage of hazardous waste from the Separations Process Research Unit (SPRU), located at the Knolls Atomic Power Laboratory (KAPL). 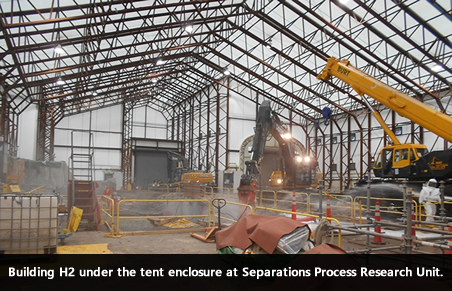 NISKAYUNA, N.Y., -- Workers have begun the last phase of building demolition at the Separations Process Research Unit (SPRU). On October 13, the Department of Energy Environmental Management (EM) and its cleanup contractor began removing the tent enclosure at Building H2, which at one time housed the interior of the one-time research facility. The enclosure was equipped with high-efficiency filters to ensure protection of the public and the environment. Previous activities included removal of hazardous and radioactive materials; isolation of utility systems; and removal of tanks, vessels, components, and miles of piping and tubing. Successful completion of these efforts led EM to determine the remaining structure could be safely demolished without the need for the enclosure. Starting open-air demolition on H2 was the latest milestone for the project collocated at the Knolls Atomic Power Laboratory in Niskayuna, outside Schenectady, N.Y.
H2 was one of two buildings at SPRU that supported improvements in the chemical separation of plutonium for the nation's strategic defense early in the Cold War. Open-air demolition of the other building, G2, began in July 2016 and is nearly completed. Demolition work at H2 culminates several years of preparation by EM and its demolition contractor, AECOM. "The EM SPRU Field Office staff and our AECOM contractor worked together closely to safely and successfully arrive at this major project milestone," said Federal Project Director Steven Feinberg. AECOM SPRU Disposition Project Manager Jeff Selvey said completing demolition of Building H2 will help accelerate efforts to safely remove the Cold War-era nuclear processing facilities. "It's a significant step forward in achieving EM's goal of eliminating the risks inherent in these 60-year-old facilities," Selvey said. NISKAYUNA, N.Y. EM's demolition of above-ground portions of Building G2 at the Separations Process Research Unit was completed on Nov. 18, a milestone in the ongoing cleanup at the former research site. The photos above show the building before demolition and after demolition. Project contractor AECOM will work to remove structural steel and concrete. Building G2 was one of two buildings where research was conducted in the 1950s on chemical processes for separating plutonium and uranium from irradiated materials. Demolition at Building H2 is taking place under a ventilated enclosure. EM Assistant Secretary Monica Regalbuto, third from left, toured the SPRU demolition project with, left to right, DOE SPRU Project Controls Lori Erbele; DOE SPRU Federal Project Director Steve Feinberg; AECOM Project Manager Jeff Selvey; EM Consolidated Business Center Director Ralph Holland; EM Consolidated Business Center Deputy Director Kash Grimes; and SPRU Deputy Site Manager Hugh Davis. NISKAYUNA, N.Y. - EM Assistant Secretary Monica Regalbuto reviewed progress in the open-air demolition of Building G2 during a recent visit to the Separations Process Research Unit (SPRU) nuclear facility. Regalbuto also observed demolition preparations for Building H2. The two primary SPRU buildings supported improvements in the chemical separation of plutonium for the nation’s Cold War defense. With her SPRU visit, Regalbuto has now toured all 16 active EM sites in 11 states since her confirmation by the U.S. Senate to lead the DOE cleanup program in August 2015. At SPRU, Regalbuto watched workers demolish the G2 superstructure and saw progress in removing steel-reinforced concrete process hot cell walls, several of which are 5 feet thick. She also observed the water spray and retention systems that ensure demolition dust remains within the project boundary. Regalbuto also viewed crews within the H2 enclosure cutting a concrete slab to allow interior wall demolition and retrieval of three remaining large storage tanks for disposal. Demolition under the enclosure is expected to begin next month. "AECOM and our DOE counterparts are working collaboratively and making great progress to safely demolish and eliminate the risk of these Cold War relics,” said Jeff Selvey, SPRU disposition project manager with EM contractor AECOM. 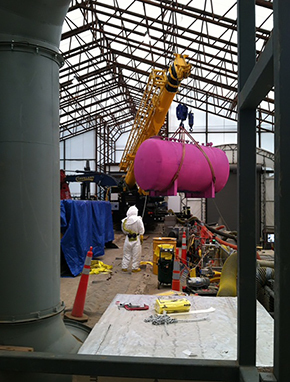 NISKAYUNA, N.Y. EM’s cleanup contractor at the Separations Process Research Unit (SPRU) nuclear facility completed preparations allowing for the open-air demolition of Building G2, which has begun. G2 is one of two SPRU buildings that supported improvements in the chemical separation of plutonium for the nation’s strategic defense early in the Cold War. Its demolition culminates several years of preparatory work by the site’s contractor, URS Energy & Construction, a subsidiary of AECOM. 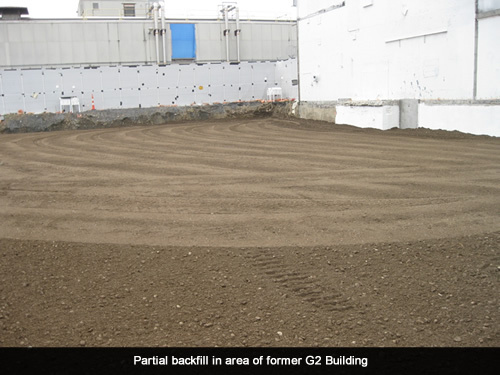 The deactivation of Building G2 included removing hazardous and radioactive materials; isolating utility systems; removing vessels and components, and miles of piping and tubing. That work was performed in a tent enclosure with filtered ventilation to ensure protection of workers, the public and the environment. Successful completion of these efforts led to a determination by EM that the remaining structure can now be safely demolished. "The EM SPRU Field Office staff and our URS contractor worked together closely to safely and successfully arrive at this major project milestone,” said Steven Feinberg, SPRU's federal project director. EM is responsible for the decontamination, demolition and cleanup of SPRU, a 65-year-old Cold War facility. A pilot plant used for researching the separation of plutonium from irradiated uranium, SPRU operated between February 1950 and October 1953. It is collocated with Knolls Atomic Power Laboratory, which is part of the network of DOE's national laboratories. Click here for more information on the SPRU project or contact Stephan Tetreault with the EM headquarters communications office at 202-287-5573 or at Stephan.Tetreault@em.doe.gov. 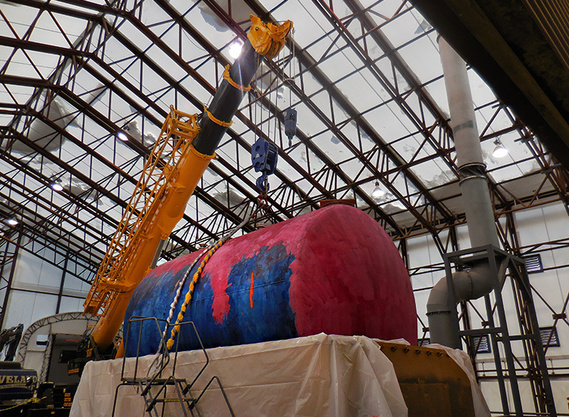 The last of seven tanks in the tank vault at the Separations Process Research Unit is hoisted for placement in a made-to-order shipping container. 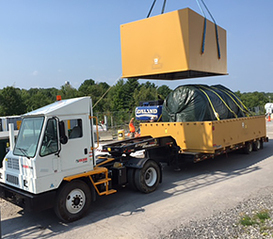 NISKAYUNA, N.Y. EM recently marked a notable milestone at the Separations Process Research Unit (SPRU) when workers removed the last of seven large waste storage tanks from a vault and shipped it to an offsite low-level radioactive waste disposal facility. The tanks were used to contain radioactive wastes from SPRU in the 1950s. They had sat empty after their contents were disposed off-site in the 1960s. The recent achievement culminated months of preparation, including expert rigging to remove the tanks from the vault, where they had been housed for the past 60 years. “This is a major milestone in the cleanup of the SPRU project. Our employees deserve great credit in completing this work safely, which sets the stage for project completion,” said Bob Smith, project manager for AECOM, which owns URS, EM’s contractor for the SPRU cleanup. EM is responsible for the decontamination, demolition, and cleanup of SPRU, a 65-year-old Cold War facility. A pilot plant used for researching the separation of plutonium from irradiated uranium, SPRU operated between February 1950 and October 1953. It is collocated with Knolls Atomic Power Laboratory, which is part of the network of DOE's national laboratories. Workers prepare the last of seven waste storage tanks from a tank vault for shipment to an offsite disposal facility. The tank is prepared for transport to the disposal facility. The closed shipping container holding the tank is ready for shipment to the out-of-state disposal facility. The Separations Process Research Unit (SPRU) is an inactive facility located at the Knolls Atomic Power Laboratory (KAPL) in Niskayuna, New York. KAPL was created as a general-purpose laboratory for the former U.S. Atomic Energy Commission (a predecessor agency to DOE). Built in the late 1940s, the buildings supported the SPRU mission to research the chemical process to extract plutonium from irradiated materials. Although equipment was flushed and drained, and bulk waste was removed following the shutdown of the facilities in 1953, residual materials were left in the tanks, buildings H2 and G2, and interconnecting pipe tunnels. In 2010, cleanup of radioactivity and chemical contamination in the SPRU Lower Level Railroad Staging Area, Lower Level Parking Lot and SPRU North Field areas was completed. The KAPL site presently conducts research and provides support for the U.S. Navy's Nuclear Propulsion Program. Currently, decontamination and decommissioning (D&D) of the following is taking place: the remaining two contaminated buildings (G2 and H2 buildings), remaining inactive waste storage tanks located within H2 tank vaults, a pipe tunnel between G2 and H2, and associated contaminated soil. 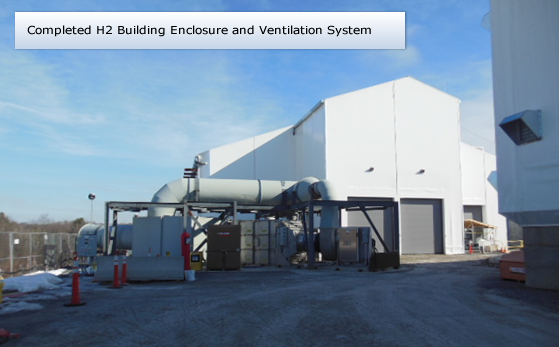 By March, 2013, tent enclosures and ventilation systems using High Efficiency Particulate Air filters were constructed around the G2 and the H2 buildings. Performing D&D work within the enclosures with the ventilation systems provides an added measure of protection to human health and the environment. DOE's contractor is taking a methodical, deliberate approach in completing the remaining work. The contractor estimates field work completion in late 2016. Niskayuna NY (February 27, 2014) - The Separations Process Research Unit (SPRU) Disposition Project completed a significant waste-treatment campaign today that involved the solidification of approximately 9,700 gallons of contaminated sludge, and 14 shipments of the waste off-site for permanent disposal. The shipment of this material removed the majority of the radioactivity at the SPRU facilities. The Department of Energy’s Office of Environmental Management (EM) is responsible for the decontamination, demolition, and cleanup of the 65-year-old Cold War facility, with work being performed under contract with DOE by the URS Corporation. SPRU is collocated with DOE’s Knolls Atomic Power Laboratory in Niskayuna, NY. "The radioactive sludge constituted one of the highest risks at SPRU," said Steven Feinberg, the EM manager of the project. "The successful solidification of the sludge marks major progress in our environmental cleanup project, and enables us to put our full attention on moving ahead with the active decontamination and demolition of unused buildings at the site." The sludge resulted from historic research into the chemical separation of plutonium, which was shut down in the early 1950s. The solidified sludge, in 28 shielded liners, is being disposed at a licensed, commercial low-level radioactive waste disposal facility in Andrews, TX, which is owned and operated by Waste Control Specialists, LLC. In addition to successfully completing the sludge solidification project, the SPRU Disposition Project achieved more than 2 ¾ years and more than 1.1 million safe work hours without a lost-time accident or injury. "This record was accomplished while overcoming numerous obstacles associated with the high-hazard construction, decontamination and demolition work at the site," noted Bobby Smith, Project Manager for URS at SPRU. 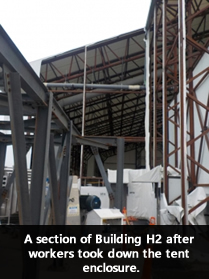 "That included working at heights to construct the Sludge Processing Tent, install ventilation and sludge system components, decommission the old sludge processing system, and safely operate the waste solidification system." On March 31, 2009 Energy Secretary Steven Chu announced $6 billion in new funding under the American Recovery and Reinvestment Act to accelerate environmental cleanup work and create thousands of jobs across 12 states. Projects identified for funding will focus on accelerating cleanup of soil and groundwater, transportation and disposal of waste, and cleaning and demolishing former weapons complex facilities.